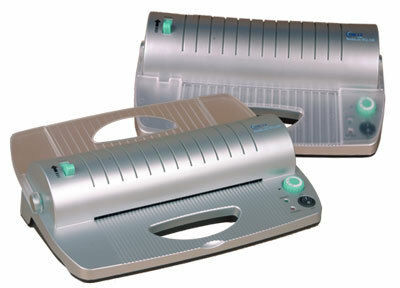 The SircleLam HQ-230 is the ideal pouch laminator for the home/small office and/or hobby enthusiast. With a lamination capacity of 9" you can preserve and protect almost any size document with the HQ-230. This innovative back to front pouch feeding laminator allows you to easily control your just laminated documents. Laminate, carrier free, any item with up to a 5mil laminating pouch. The HQ-230 9 inch pouch laminator includes a reverse lever to clear any jam, has a quick 6 minute warm-up time, and also features separate power and ready LED lights along with an eco-friendly stand by mode that preserves power when not laminating. A convenient carry handle allows for easy portability between the home and school or office and/or a scrap booking get together. Sircle Corp specializes in a full line of Laminating Pouches, from small credit card laminating pouches to the most popular business card and letter size laminating pouches up to large menu size laminating pouches. Take advantage of our low prices on all of our Laminating Pouches.